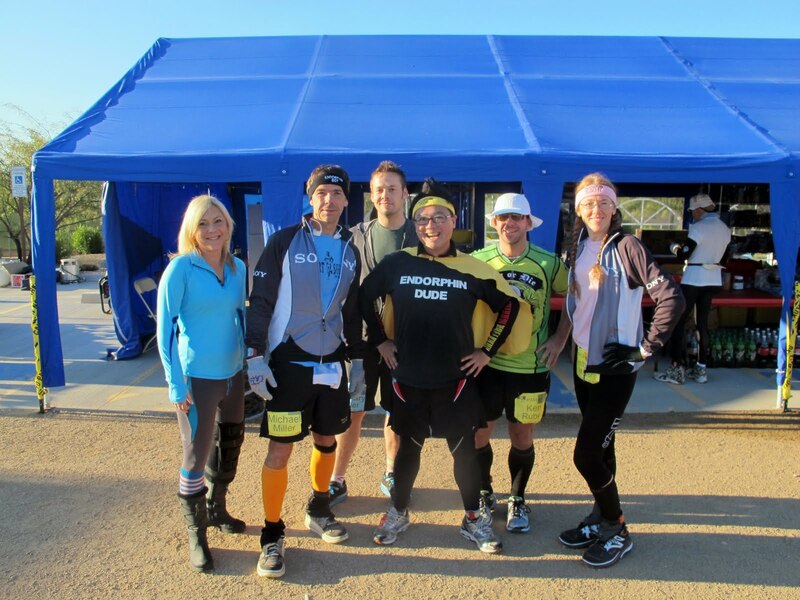 A few days before the final race of my Titanium Quest, I received an email from my publicist. My first thought was, "Huh, I have a publicist?" Apparently, the folks at Power Capes had their PR people contact me about hitting the media circuit. That came completely out of left field, but then again, it's not every day that someone completes 52 marathons in 52 weeks, so this is news worthy! I happily obliged. I showed up on race day ready to throw endorphins at Fox News. I experienced runner's high early in the morning for two reasons: A) Across The Years was #52, and B) I was going to be on live TV! I really wanted to burst out with an emphatic "LIVE FROM NEW YORK, IT'S SATURDAY NIGHT!" but I opted to engage with the news reporters like a professional instead. Behold, here is my live interview. You be the judge as to how "professional" I am! This Titanium Quest was a lot like a video game: you keep running marathons to move up in levels until you reach 10 stars. There have been numerous times when I saw the Endorphin Dude avatar quickly fade and the much dreaded "Game Over" warning blink before my eyes. But I never gave up. Injuries almost knocked me out of the race, but I fought to get to every finish line, even when it hurt the most. 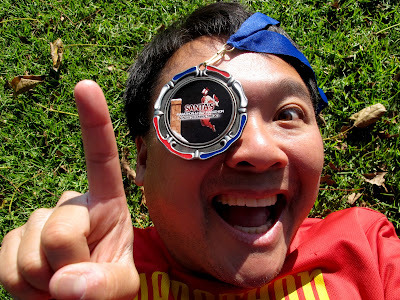 Had I been on track to completing a marathon every weekend, I would have hit the halfway mark at the Seattle Rock 'N' Roll Marathon by the end of June. That did not happen. Capsulitis, tendonitis, sciatica, and kidney stones pushed me behind, and as a result, I did not reach #26 until the end of August. It really looked bleak for me, but I kept going. I crammed in five doubles and two triples in the fall, and that's how I got to #52! There's my Titanium cake, and I'm gonna eat it too! Thanks Yolanda! I may be the one wearing the cape, but I was surrounded by super heroes at Across The Years! I came to Across The Years fantasizing about the 50 miler. How awesome would it have been to finish Titanium with a whopping 50 miler? Unfortunately, that was just not in the cards. Even with ten days of rest, I did have 51 marathons on those tired legs. I decided to just take my time and take it easy, as I had 24 hours to complete the required 50k distance. As I strolled along the one mile loop, I had the opportunity to reflect on my incredible journey. I thought about every Marathon Maniac and Half Fanatic whom I have met on the race course or online this past year. I flash backed to Mardi Gras, Seattle, and Morgan Hill--the marathons that caused me grief. 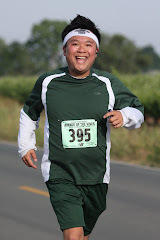 I smiled as I basked in the glory The Tahoe Triple, Labor of Love, The San Francisco Marathon, and Chicago. Most importantly, I went back to that day when I had my heart attack scare three years ago. As the day went on, I continued to circle that one mile loop. When I reached the marathon distance, I posted on my Endorphin page that I was a tiny 10k away from Titanium. The flood of encouragement and congratulatory posts poured in. I truly felt like the whole Insane Asylum and all my running friends were cheering me on as if I were Ryan Hall going for the victory in Boston. I kept plugging along. With only two laps left, I caught up to Yolanda, who gave me the biggest smile I had seen all day. She said to me, "This is it, isn't it?" I quickly responded that I only had two laps left and I wanted more than anything to cross that finish line with her, the person who told me about this little club called "Marathon Maniacs." Together, we powered it in. This is me just a few feet away from that finish line! 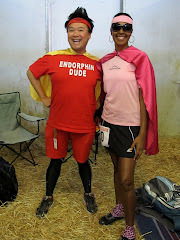 When I crossed that finish line, I immediately gave Yolanda a hug so big that I thought she was going to pop. I then dropped to my knees in shock. I looked up and the race director stood there with my cake. Other runners arrived at the finish line and I hugged them one by one. There was Mad Hatter Fancy Pants, Kansas, Ken Rubelli, my Endorphin Dudette of the month Kimberly, her son Zachary, Uncle Mike, and even the runners I had just met. And just when I thought it couldn't get any better, I looked up at the clock and was stunned to see that I completed a 52k. What a way to end this quest, 52 marathons in 52 weeks with the 52nd being a 52k. I absolutely could not believe that this day finally arrived. 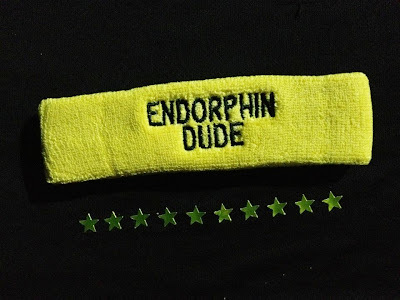 Endorphin Dude is a TITANIUM Level 10 Star Marathon Maniac. WOW!! WOW!! WOW!! It's all about heart, and this is the only part of me that never cramped up. I did it. 52 marathons in 52 weeks. I am still in shock. Peeps of the Endorphin Empire, thank you for your overwhelming support. I encourage you to dream big, but also know that you must work hard, take risks, and make sacrifices. Only then will everything fall into place. Runner's high has taken me over the moon, and right now I am dancing on cloud nine with 10 shiny stars circling around me. Titanium Score Board: Completed. Mission Accomplished. Dear Santa, all I want for Christmas is Titanium. Is that too much to ask? I've been nice all year long. Well, there was that one naughty moment when I peed on someone's flowers, but the port-o-potty line was too long. It's not like I pooped on their rose bush. I hope you won't hold that against me. Yeah, that's right, KEEP GOING! I felt a bit of guilt for peeing on that flower bed, so I made sure that I did a good deed at this marathon. I took the early start and marked the course for the race director. I wanted Santa to cancel out that naughty with this nice. I wish I was more artistic so that I could draw exciting graphics on the concrete, but alas, my sister is the one in my family that got that gift. Instead, I scribbled arrows and directions for the runners. I didn't realize it at the time, but one of my scribbles had a double meaning. When I wrote "Endorphin Dudes says keep going," I meant that in the very literal sense. I was telling the runners to keep moving forward. I now see motivational meaning behind "keep going." How apropos, as this was my mantra all year long. In any case, I plugged along on the four mile loop until all the runners arrived for the start at the crack of dawn. And there it is! The crack of dawn! Ok, I didn't just scribble down directions. 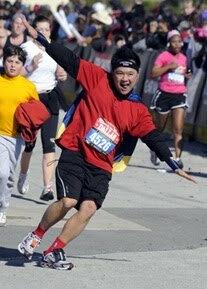 I wanted to entertain the runners too! I didn't recognize Jessica Wabbitz until she hopped up to me. Finish line with Race Director Charlie Alewine, my twin brother Esteban (I'll explain that on in my book) and the Van Gough'ed Jessica Wabbitz. I smiled ear to ear when I crossed that finish line because I knew that I only had one left after this one. The best part was that I had a whole 10 days off before #52, so I would be very well rested. As happy as was, I couldn't help but feel a little bit of sadness because this would be my final Charlie Alewine race. Charlie has been instrumental in getting me to my goal. 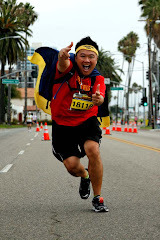 Without his races, I would not have been able to double and triple up on the marathons to make up for the ones I lost during the sciatica days. If I lived in southern California, I would run many more of his races, but unfortunately, my wallet will not allow it. I'll definitely be back for his races in the future, but it just won't be every weekend. Thank you Charlie, I'm going to miss running every weekend with you! Titanium Score Board: 51 down, 1 to go. Only one left and I reach my goal of 52 marathons in 52 weeks. Can I get a WOOT WOOT!?!?!?!?!?!!? It's my final weekend of car camping in the Mini-bago! I am ecstatic that I will no longer need to sit through Friday rush hour traffic as I inch along 400 miles to southern California. No more snoozing in my car in random parking lots so I could run a race at dark o'clock early Saturday morning. Woo hoo! Titanium is really taking it's toll on me. My body and mind are absolutely beat. You know when you're in trouble when you cramp up before the race. I found myself sleeping in my car in an alley behind a gas station in El Segundo. I woke up with a slight cramp in my leg. I got out of the Mini-bago, stretched a bit, took a make shift shower in the form of bottled water splashed on me, and headed to the start line. I tried to run but my legs were not having it, so I did my version of the power jog. Thank goodness there were no cameras around. I really struggled through this marathon. My feet hurt and my legs stiffened up, but I had to get it done. I kept plugging along patiently. It took me awhile to get to that finish line, but I got there. I stayed focused and kept my eyes on the prize. Love these two random trees. It's like a really tall person standing next to a short one. #50 for the year! Can't believe it. It seems like it has taken a decade to get here. I am soooo close. ONLY TWO TO GO!!! Titanium Score Board: 50 down, 2 to go. There's someone behind me, isn't there. This is the course for the Seasons Greetings Marathon. 13.1 miles along a canal in Riverside, CA, and then back. My legs were aching after the rattle snake marathon the day before, so I decided to run this with my dog. Who am I kidding, the chiweenie can't run. We walked it. 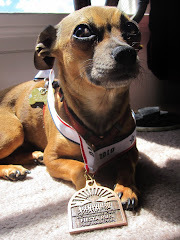 Listen to me, now I'm blaming my 6 pound mutt for me not running. 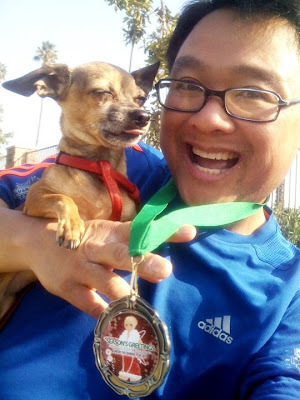 Ok, ok, ok, I walked this whole race with my dog because I was dog tired! There, I said it. If Chewbacca could run a full marathon with me, I'd take her to all my races. However, my dog has the legs the size of French fries, so she can really only last about a 5k. I have to carry her in her doggie back pack most of the way. She did very well at the canal though, clocking in about 4 miles of walking. 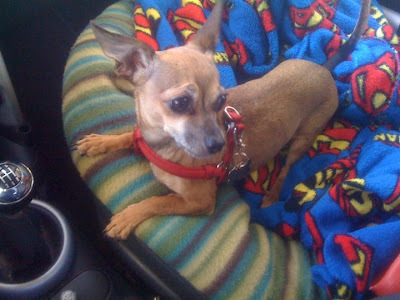 After that, she got tired, so I stuck her in the chiweenie dorm on my back. Geez, I wish I could have someone piggy back me for 22 miles. Having Chewbacca along for this walk-a-thon helped ease my aching legs and mind. It felt like 2009 all over again when the two of us took those long urban hikes all through San Francisco. My mind was completely at ease as I walked along the canal with my best friend. 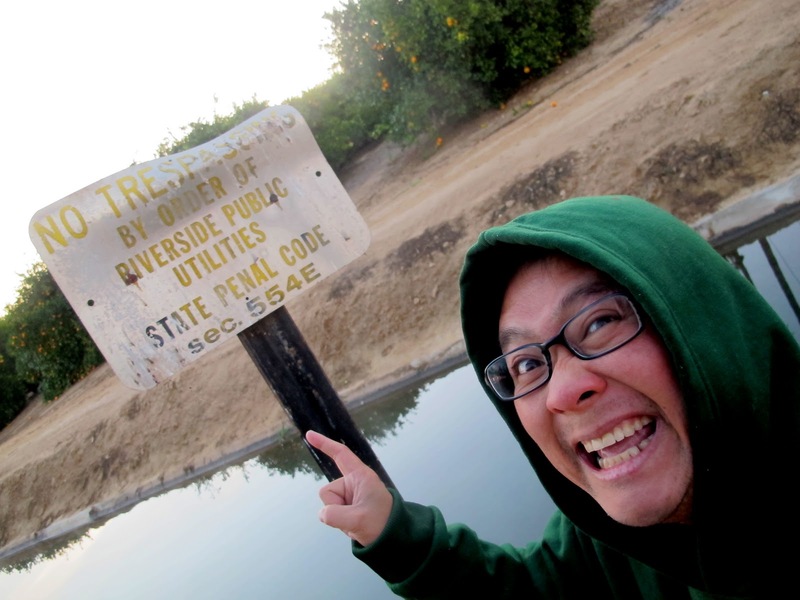 Yeah, I'm the Canal Troll, and I'm gonna break the law! Looks like there is going to be 6 more weeks of winter! Peking duck? More like Peking Chiweenie! I owe a lot to this six pound flea bag. Because of her, I got healthy and am now in the best shape of my life. Chewbacca was a rescue dog with a pretty troubled past. She was a pregnant stray when the Peninsula Humane Society found her. There was probably some abuse that went on as well. Thankfully, the kind folks at PHS took very good care of her. I knew right away that she was the one for me and it didn't take long before I adopted her. People tell me all the time that I did a good thing by rescuing this dog, but the reality is that she rescued me. For those who don't know, I am pursuing Titanium for all of Chewbacca's homeless four legged friends. 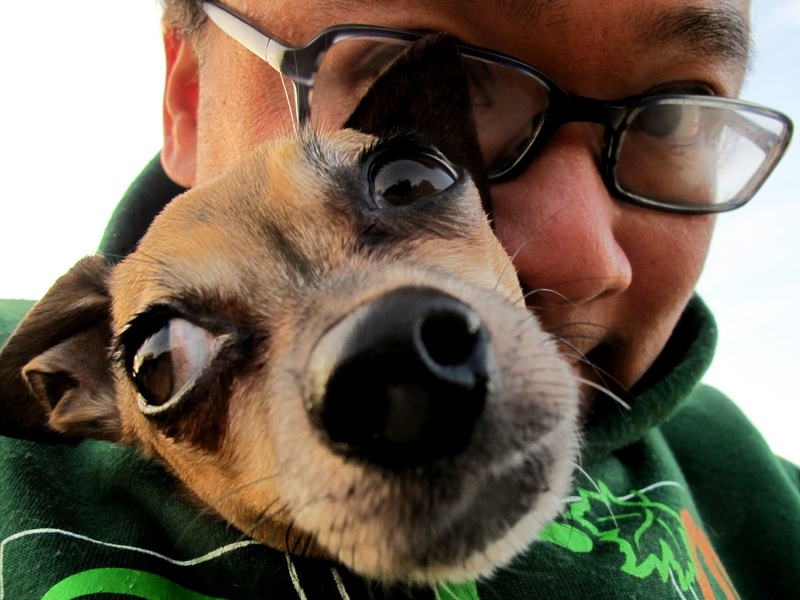 All proceeds of my fundraising will go to the Peninsula Humane Society, the folks who helped me find my side kick. This dog has changed my life for the better, and it is my hope that her furry friends at the Peninsula Humane Society will do the same for another. If you would like to throw some coins at the chiweenie, please do so here! Titanium Score Board: 49 down, 3 to go. I love that Chewbacca looks so unimpressed. Sorry Chew, we're going home now, promise! Only three left! COUNT IT DOWN WITH ME PEEPS! THREE!!!!!!!! 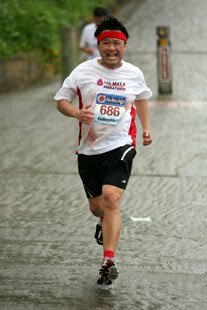 I had a little break last weekend and only had to run 39.3 miles. Now it's back to the marathon double weekend. I only need to complete two more 52.4 mile weekends and a single and I hit my Titanium goal. I'm getting so close, yet these final races get harder and harder. I am exhausted. On top of cranking out the 26.2 miles, I have to deal with traveling 400 hundred miles and car camping in the Mini-bago. I can tell you that sleeping in a Mini Cooper is like trying to snooze in coach on a transatlantic flight. These are the things I have to do to get to Titanium. For life time marathon #55, I returned to roam the rattle snake invested trails Sycamore Canyon. Up and down hills that never seemed to end, I plugged along. 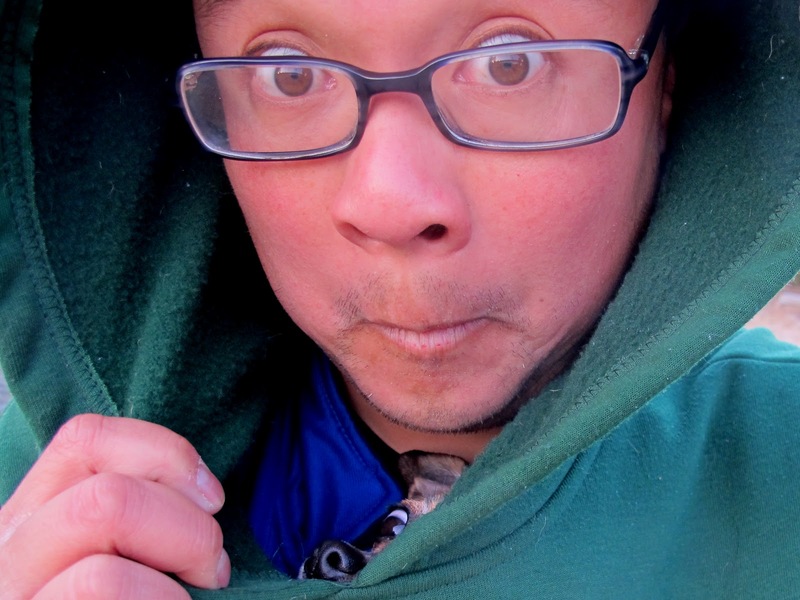 I started out with four layers because it was so cold at dark o'clock, but by 10am, Mr. Sunshine threw rays of warm shines at me. I had to peel most of what I had on off. 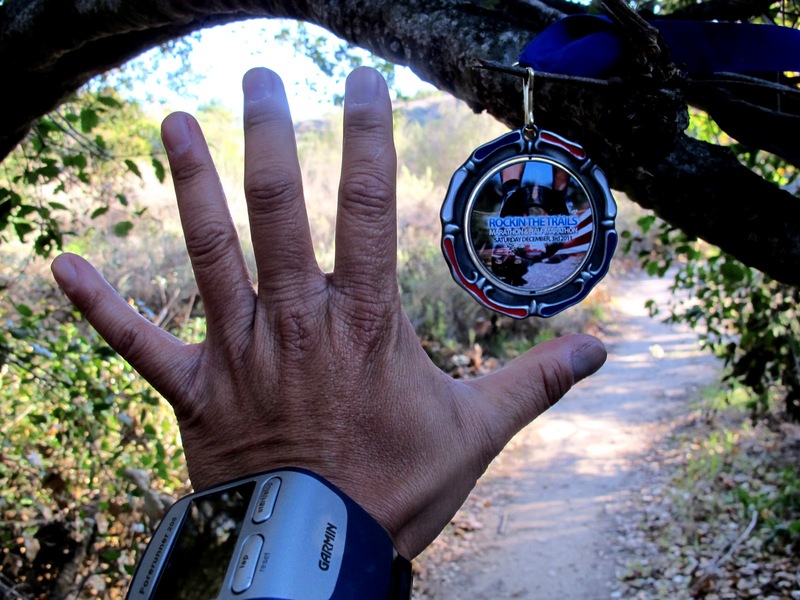 If it had gotten any warmer, I probably would have had to complete this marathon naked, which wouldn't have been a bad thing because it would have scared all the rattle snakes away! In any case, what got me through this brutal trail race was a couple of Marathon Maniacs who kept me laughing throughout the 26.2 miles of trail hell. These two kept me plugging along on the trails. I asked for an action shot, and Jean Ho delivered! Dale Dale on the trail. I'm so happy to get this done because it brings me one step closer to reaching my goal of 52 marathons in 52 weeks. Like I said, as I get closer and closer to the goal, it gets harder and harder. With only a few left and a lot at stake, it's do or die. I have to finish the mission. Any DNF at this point and it's GAME OVER. Titanium Score Board: 48 down, 4 to go. 48 down. Really? Wow, that just sounds so surreal. ONLY 4 LEFT!!! 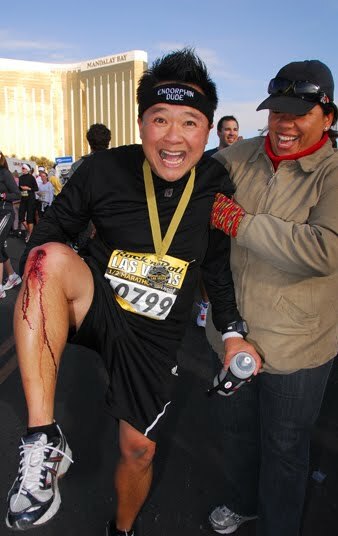 There was a lot of drama at the Las Vegas Rock 'n' Roll Marathon and Half this year, and none of it was caused by Kate Gosselin. Ok, the mom of eight may have stirred up some controversy when she was rumored not to have completed the full course, but the real drama was with the Competitor Group, the folks who put on the event. With 44,000 runners and walkers out on The Strip at night, something was bound to go wrong. Sure enough, the truck load of complaints from participants pretty much short circuited the Competitor Group's Facebook page: over-crowding at the starting corrals, lack of electrolytes, contaminated water which got many violently sick, the now infamous "Merge" where the marathoners met the halfers at the 13.1 mile mark, congestion at that finish line, and running out of medals. Yes, I was affected by some of the above mentioned, but at the end of the night, this race goes down as one of the best racing experience of my short running career. Why? Because I got to be the Best Dude at the run through wedding for my Half Fanatic buddies, Jennifer and Mitchell! My non-Disney Goofy Challenge turned into a Goofy Challenge after all, thanks to the Disney-themed wedding gear. Jennifer and Mitchell are both Disney fanatics, so it did not surprise me in the least that my Best Dude shirt had Goofy on it. After completing my trail marathon the day before--mind you, that marathon was my eight marathon in four weeks--I made up my mind early on to take this one easy. I did achieve this goal, but before the race I had to deal with a potentially catastrophic five-alarm fire drill. 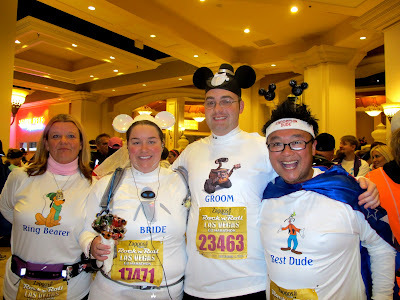 Because of the crowds, I couldn't get onto the shuttle to get to the wedding corral, so I had to sprint to the bride and groom, dodging tourists and other runner's walking to the start line along the way. Fortunately, I managed to arrive with a few seconds to spare! Had I been tardy, it would not have been the first time. I created an uproar a decade ago when I got lost and showed up to my buddy's wedding 13 minutes late. The problem? It was a 20 minute ceremony! To make matters worse, I was in the wedding party and I was carpooling his 13 and 10 year old siblings. Not good. I did make it to that wedding and the groom and I are still friends! I did not want a repeat of that with Jennifer and Mitchell. Needless to say, I was relieved to make it to the wedding corral on time. I think the bride and groom were too! With all the hoopla of getting there and the excitement of the race, all the things that went wrong for others didn't really bother me. Yes, I did almost get side swiped by a marathoner as I veered onto their lane to get to the nuptial site at the mile two mark, but I had to get to the far left or else I would have miss the ceremony! I don't think that marathoner was too happy with me crossing over, but I had to get there. Sorry about that, BQ lady! As for the contaminated water, I didn't drink any of it. In fact, when I realized that there were was no Cytomax left on the course, I walked into a liquor store and bought myself a Hawaiin Punch. That kept me energized for a few miles. Then the rain hit. At that point, I was so cold that I started to run just so that I could get out of the cold. I crossed the finish line late enough to avoid the gridlock but early enough to get a medal. 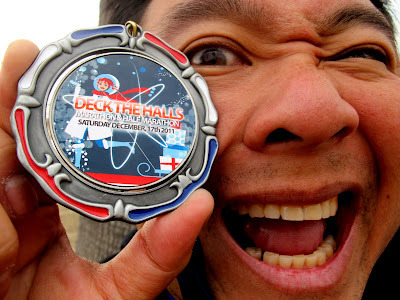 Granted, it was the wrong medal, but at least I didn't walk away with a naked neck. Note to self: email Competitor Group to get a half marathon medal. Gotta get to the chapel on time! Waiting to hear Jennifer and Mitchell say "I do." I first met Alma on the plane en route to NOLA. I saw her again in Seattle. Now I see her in Sin City. Woo Hoo! The newlyweds with their entourage. Finally got to meet Half Fanatic Scott from Chicago. One of my favorite peeps in the Insane Asylum. Tyler Rich! Endorphin Dude and The Launders! Well, the female is no longer a Launder. My Sin City Rock 'n' Roll experience was a fun and memorable one. I understand that many people got sick or just flat out had a lousy time, and I am sorry for those folks. However, I had an awesome time. Not only did I get to witness two buddies tie the knot, but I got hang out with a bunch of my running peeps and I scored the best race shirt of the year. I really felt like the Best Dude all around! I said it before, I'll say it again: BEST. RACE. SHIRT. EVER. On a final note, at my mile 11, a woman ran up next to me, slowed down, and walked beside me. She was at her mile 24. She said to me, "This is my first marathon. 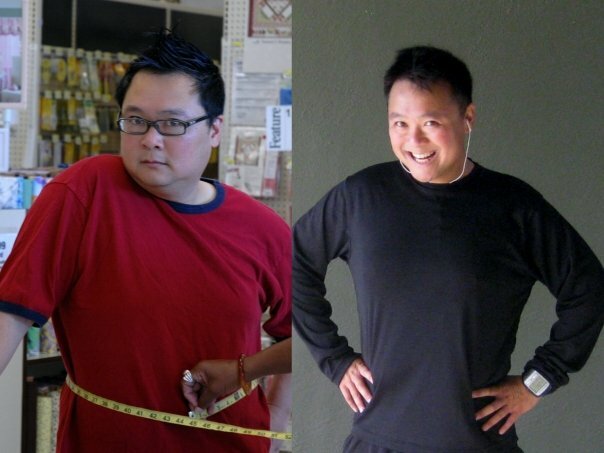 I lost 70 pounds because of you. 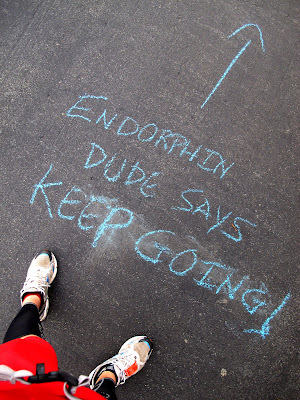 Thank you, Endorphin Dude." She then sped off. I didn't get a name and for the life of me, I can't remember what she looks like. This woman shocked me. I was absolutely stunned. I couldn't get that moment out of my head. I still can't. In a perfect world, I would have completed a marathon every weekend for 52 weeks to earn my ten stars. Completing 26.2 miles and then having a full week to recover is the most ideal way to hit this lofty goal. However, life happens: injuries strike, races get canceled, and sickness rears its germ infested head. In planning my Titanium quest, I not only had to have a plan B, but I also needed a plan C, D, E, F, and the rest of the alphabet. Right now, I am at plan Y, as in “Y oh WHY oh WHY? !” I lost about 12 marathons throughout the first three seasons because “life happened,” hence I had to modify my schedule and cram in six doubles and two triples in the fall. Needless to say, I am tired. 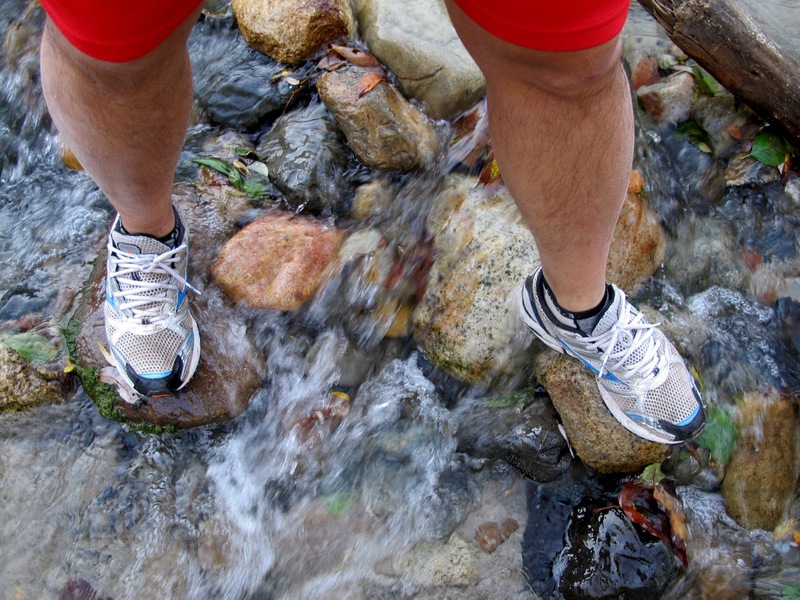 When Charlie Alewine added the “Rockin’ The Trails Marathon” to his schedule, I jumped at the opportunity to run it. This race in Orange County coupled with the Las Vegas Rock ‘N’ Roll Half Marathon the next day made for the perfect non-Disney Goofy Challenge weekend. Logistically, hitting these two races proved to be quite a challenge, but I made it work. Check out this itinerary: Fly out of SFO Friday evening, arrive at LAX by 9pm, pick up car rental at LAX, drive to Orange County, car camp, take the early start at dark o’clock, finish race mid morning, drive 275 miles to Las Vegas, pick up bib, carbo load, sleep, run race next day, return rental car in Las Vegas, fly home. Up to this point, my body is so used to all this running, traveling, car camping, and what not, that this crazy weekend schedule didn’t phase me one bit. ‘Tis the life of the Marathon Maniac! Gotta be extra careful. Wouldn't want to fall in and destroy the camera! You probably figured out from the name of this marathon and the photos above that this race is all trail, a surface that I do not love. I’ve said it before, I’ll say it again: Endorphin Dude on trails is like an American on the dirt of Roland Garros. These endorphin legs are just not equipped for this surface! 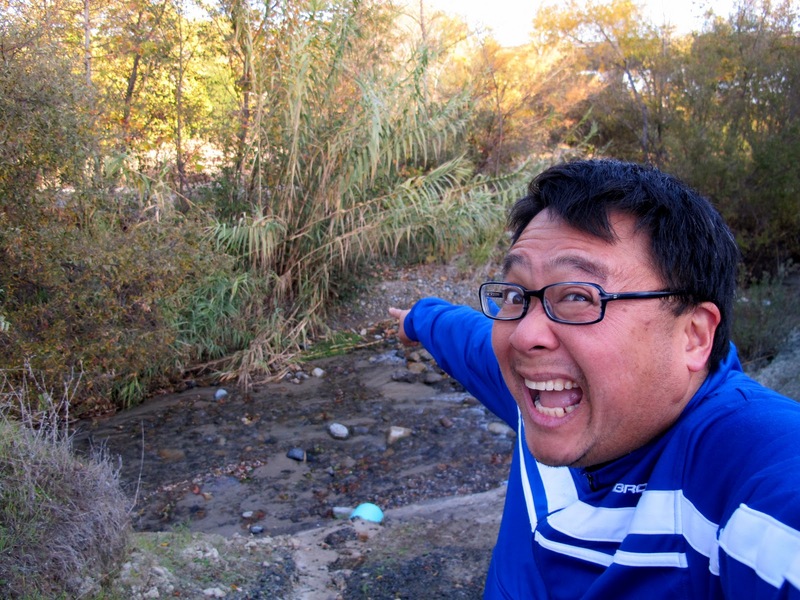 Nonetheless, I had to face the Trabuco trails in order to reach my Titanium dream. I’m not going to lie or sugar coat. 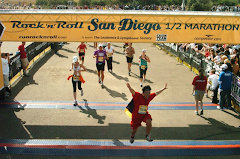 I did not love this marathon, but that probably doesn’t come as a surprise to any of you. I had to run up and down hills, jump over big rocks, dodge dirt bikers, and hop from stone to stone Frogger style to make it across the creek. Well, I ain't no Kermit The Frog. I missed one stone and fell right in. The water was only about 6 inches deep, so I didn’t have any worries about drowning. My big concern was that I landed on my bad foot, and the last thing I wanted was to have it aggravated. Fortunately, this slip happened later in the race so I was able to limp my way to the finish line. The good news is that I finished this marathon with no injuries! I also took another step closer to Titanium! Feeling good, I jumped into my rental car and headed off to Sin City. 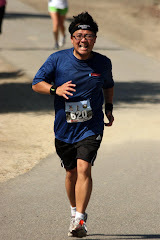 I knew that I could relax the rest of the weekend, as the next race was only 13.1 miles. I can do that in my sleep. Titanium Score Board: 47 down, 5 to go! I can now do the count down with one hand! FIVE!!!!!!! !